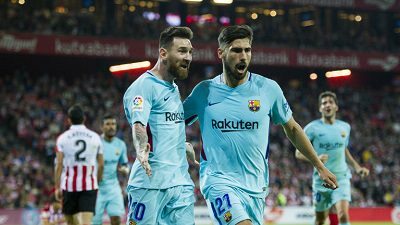 FC Barcelona continued to their unbeaten to the season with a 2-0 victory over Athletic Bilbao 2-0 at the San Mames Stadium. Lionel Messi gave Barça the lead in the 36th minute. Although they were outplayed in the second half, Barça managed to claim the three points after Paulinho scored in stoppage time. They remain 4 points ahead of Valencia atop of the standings. Next up is a trip to Greece as they face Olympiakos in their fourth group stage match where they only need one point to clinch a spot in the knockout stages. Athletic: Kepa; Bóveda, Unai, Laporte, Lekue; San José (Beñat, 68′), Iturraspe; Williams (Susaeta, 83′), Raúl García, Córdoba; & Aduriz. FC Barcelona: Ter Stegen; Sergi Roberto, Piqué, Umtiti, Jordi Alba; Busquets, Rakitic, Paulinho; André Gomes (Semedo, 82′), Messi & Luis Suárez. Goals: 0-1 Messi (36′). 0-2 Paulinho (91′). Cautions: Iturraspe (40′), Busquets (46′), Piqué (62′), Paulinho (74′), Umtiti (80′). Previous PostBarça defeat Real Murcia 3-0 in Cup clash. Next PostBarça and Olympiakos play to a goalless draw.